The debate of grain fed beef vs. grass fed beef is getting quite heated from the two sides. I didn’t’ even know there was two different methods of growing beef until the last five years or so. When I started looking at the two different models I wasn’t sure there was much difference at first but after closely looking at the two methods I have seen some interesting facts come to the surface. There are lots of independent peer reviewed research done on the different aspects of the meat and as I look through the different studies I see patterns form that lead me to a few conclusions on which side of the fence I will stand. Another factor in determining the difference is to watch the money trail. Who is benefiting monetarily from the claims being made? If a company growing corn raves about grain fed beef it doesn’t carry much weight since they mostly sell corn to grain fed animal operations and they have a vested interest in the grain fed beef industry. What are the bias influences? All opinions are bias including mine so take what I have to offer as something to think about and do your own research to get a knowledgeable conclusion for yourself. At this point you may be asking why should I put any faith in what this guy has to say? Good point and I will say that I have done an extensive amount of reading about this subject and I have witnessed both farming models for myself. I have been raising grass fed beef for our own use for the past few years and have experienced the difference first hand. I have been looking at the bigger picture of health, nutrition, and quality of lifestyle and have observed that there are numerous differences between the two agricultural models. Here are a few items I want to look at to determine the difference in the two paradigms of beef . Nutrition is one of the biggest discussion topics when comparing grain fed beef to grass fed beef. More times than not the grass fed side of the debate will show how the nutrient content is much higher than grain fed beef and when I have looked at the data of the two there is clearly more nutrients in the grass fed beef. Many labs have documented that all vitamin and mineral levels are higher across the board for grass fed beef and in many cases a lot higher. Chemical and toxin exposure The chemicals that are the biggest concern are pesticides and herbicides and the exposure can be in both grain and grass fed beef however it is more common in grain fed beef due to the fact that most grain crops like corn, soy, wheat, and oats are grown with the use of chemicals. The grain fed cattle producers claim that the chemical residue does not show up in the beef however when the meat is tested there is more chemicals found in the grain fed variety. The worst culprit is a chemical called glyphosate and it has been found in nearly all grain fed meat products and it has been found to cause damage to our digestive tract which then impairs our immune systems. There is also the issue of medications and antibiotics and these tend to show up more in grain fed cattle. living conditions/animal welfare This is something most folks don’t even think about when choosing their meat since the consumer is usually unconnected to the farmer that grew their meat. Why should the consumer even think about the living conditions of the animals they consume? You can’t expect top quality meat from animals living in poor conditions. Large commercial beef growers raise thousands of animals in areas known as feedlots. The corporate leaders say that feedlots must be used for efficiency and that is true since all the feed and waste has to be hauled to and from the cows. They claim the animals have lots of room however it is all bare dirt and concrete and what pasture they do get is so spars due to the number of animals and so they end up getting fed hay and a ration of other feeds rather than fresh grass. 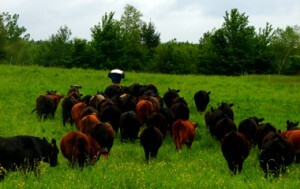 A properly managed grass based farm should utilize as much quality pasture as possible. Environmental impact This is another area that most people don’t give any consideration to unless they live near a large commercial farm. As the number of large farms increase so do the problems of soil and water contamination as there are so many animals concentrated in one area. It is a fact that grain fed beef cost less per pound than grass fed beef but when you figure the soil and water damage done by concentrating large numbers of animals in one area for the sake of efficiency then the grain fed beef doesn’t seem so cheap. Economic When I look at the big economic picture I am thinking in terms of what portion of the food dollar the farmer gets. I have seen several different figures but the reality is that most grass fed operations retain more of the dollar than grain fed producers. Quite simply there are more expenses to raise grain fed beef because it takes more equipment, labor, fuel and infrastructure. When you take these expenses out it doesn’t leave as much profit for the grain fed beef farmer. Why should this matter to the consumer? It is a matter of what do you want your money to support. The more I learn about grass fed and grain fed beef the more I want my money to support a business that is environmentally, socially, animal and farmer friendly. I also like to support my community and keep my dollars local so I try to buy as much food local as I can. Sustainability It is important to understand that if our food growing process is taking more from the land than giving to it that sooner or later we are going to run into some sort of a crisis. 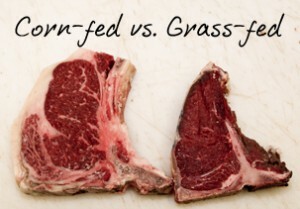 This is one of the largest differences between grain and grass fed beef. The process of growing annual grains is that it keeps depleting the soil and adds nothing back to it. The soil nutrient level in commercial farm land is falling at a fast rate. On the grass side of the picture you have the cows harvesting the grass, leaving behind their own fertilizer that replenishes the soil and leaves the grass it ate more nourished than before it came. I love seeing this first hand because every year my pasture looks better than it did the year before. This is sustainability at work. Farmer lifestyle This may be more about opinion of what one considers optimal lifestyle but I have read several books about the great way of life a grass based farmer enjoys. It is clean, refreshing, lower stress, more family oriented, and some say the work may be harder but yet it is more enjoyable. Grain based farms have more concerns about weather, rainfall, market prices, equipment failures, employees, weeds, and insects. I haven’t run across any books that rave about the lifestyle commercial farming brings. There may be some but the norm is usually comments about how hard farming is with little reward. An indication of this is the fact that many kids are not encouraged to stay on the farm but encouraged to find other occupations. The average farmer today is over the age of 65 and there are very few young farmers entering the industrial farming model. On the other hand the largest growing sector of agriculture is grass based organic farming. Accountability Most of industrial grain based farming is regulated by government agencies. What needs to be considered is that the regulators are influenced greatly by the corporations they are regulating. Kind of like the fox guarding the hen house. Also the food distribution companies (middle men) have done a really good job of keeping the consumer out of touch with the farmers so the consumer doesn’t see what takes place to get their food from the farm to their plate. This makes for cheap food but not good food. As for the grass fed beef industry there is some of the same problems however as more and more people turn to getting their meat locally and direct from the producer this increases accountability greatly. If the farmer provides an inferior product the customer doesn’t return but if the farmer has a superior product the customer is happy and spreads the word. Is all grass fed beef the same? The simple answer no. 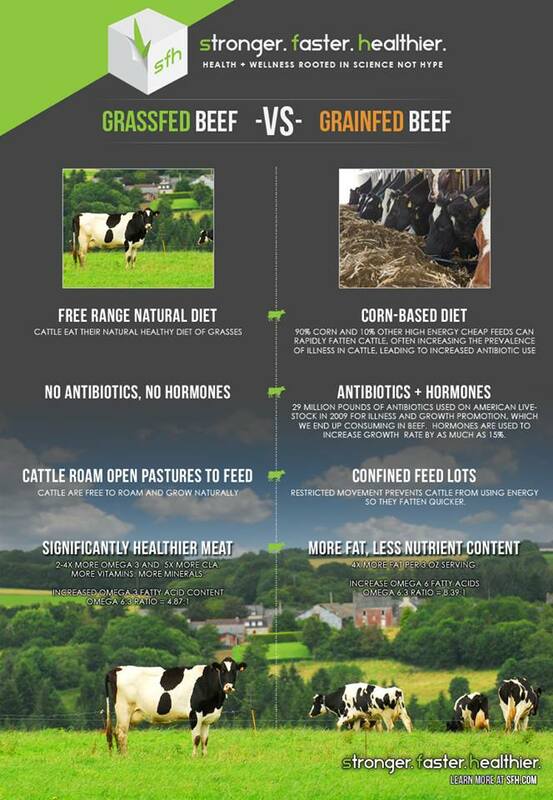 Even though there is a great deal of information showing the benefits of grass fed beef over grain fed there are grass fed models that don’t do the name justice. There are several producers marketing their beef as grass fed but they still feed grain to the animals in the last 100 days or so to put more weight on the animal and this diminishes the quality of the meat. This method can actually be used in certified organic meat as well it’s just that the grain has to be certified organic. This is why I so strongly encourage people to know how your meat is being raised and be sure it is 100% grass fed and finished with no grain. Seek local sources that you know you can trust and if you can’t there are a few online suppliers that are trustworthy and you can see more about them on our where to buy grass fed meat page. 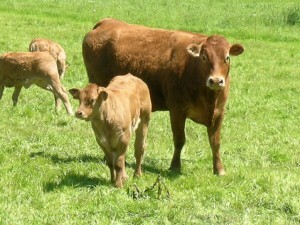 We also grow beef and chicken for local people around us and you can see more about that at our store page. 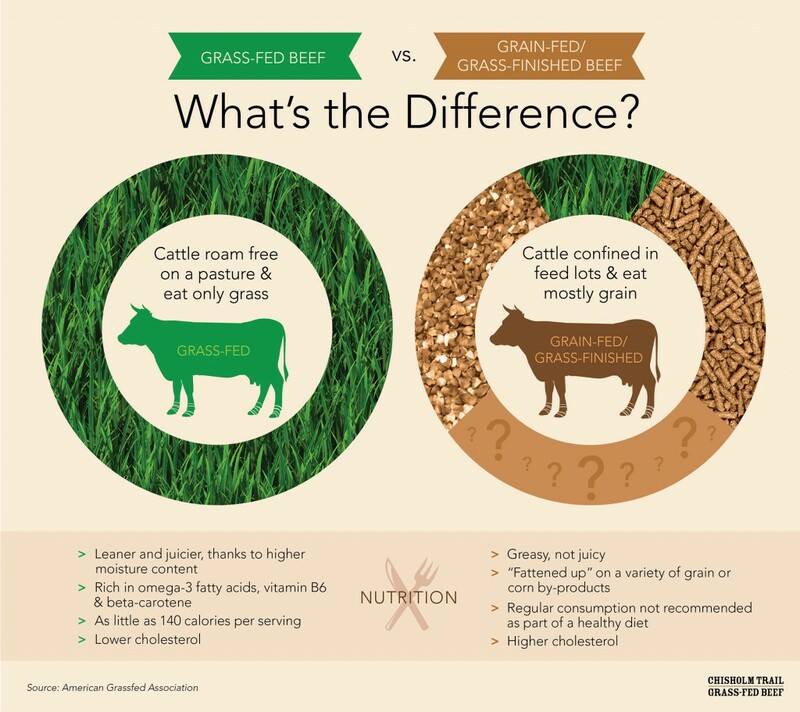 I hope this information helps by shedding some light on the difference between grass and grain fed beef and I would like to hear your thoughts on this topic. please leave any questions or comments below and I will respond to them. Thanks for stopping by and God bless! Organic or grass fed all the way. Grain fed cattle are full of hormones that get stored in the fat and enter the food chain, as does the antibiotics that they are fed making us more at risk to viral infections due to us building up a resistivity to antibiotics rendering some ineffective. Looks like you have been doing your homework Derek! It is true that toxins are stored in the fat and personal I would rather be eating meat than fat anyway but the grain fed beef industry opts to put fat on the animals since fat equals weight and weight equals $ however fat doesn’t equal quality. The antibiotic issue is getting huge as our society has abused antibiotics to the point that it is creating more problems than it is solving. Keep up your learning and seeking my friend! I found your article very interesting and helpful, I really enjoyed the lecture! Few years ago, I used to work on a farm as a volunteer in order to travel while working and having a small income as well. All the volunteers were milking, feeding, and take care of the cows and their calves. We had unforgettable times, but on the other hand, it was very sad. So I can tell the difference the way the cows are fed. Even in the milk there are antibiotics because most of the time their udders get infected due to the bad living condition. There is no doubt that those animals are fed with synthetic food that contain both antibiotics and hormones. Due to this experience, I don’t eat meat anymore, but I would suggest to any one who eat meat to buy only grass fed meat! Thanks for sharing your thoughts and experiences Daniella. It can be disheartening to see what takes place in our industrial agriculture world and I can understand why many like yourself choose not to eat meat. The good news is that there are becoming more and more animal and people friendly farmers that are producing a quality meat product that is doing more good than harm to our world. Thanks for stopping by! This was a really interesting and thought provoking post. With all of the talk about beef, chicken just meat in general has me rethinking eating meat. I think there are to many pesticides, hormone and other altering the substances that affect our foods. We are so unaware of what we are consuming. I am glad that I was able to gain some sort of understanding. We definitely need to consider addressing these conditions that the animals are living in. Glad this got you thinking Kisha! Most people have no idea what takes place to get their food to them. When you start looking at the industrial food system it is amazing how unhealthy it is. It really pays to seek local, clean, safe food that you can trust. It is just better for everyone! There’s no end to this big beef companies cruelty towards their livestocks. I am sure many people have seen the horrendous practices they do to the cows from childbirth to butchering. But It’s nice to know that you have given a good research about grass fed cows. As far as I know, if the cow is living in a nice place naturally, then, It’s all good. Thanks for the comment Raymont! When there is no accountability by the paying customer the industry can get away with a lot. We want our customers to come to our place and see first hand what we do and if something is not right we know they won’t be back unless we correct things. But mostly people are just enthused to see that their food is being grown and handled in a clean healthy environment. Hey Jason – I made the switch to grass fed beef about a 6 months ago when I switched to a more paleo diet. I just recently got some blood work done and my cholesterol is way down. So low that my doctor took me off my cholesterol meds! He thinks it is because of the increase in Omega 3’s and decrease in Omega 6’s. I feel better too. I love a good roast though especially on Sundays after church. Do you have a recommendation of where I can get grass-fed beef roasts? What cut should I be looking for? That is awesome that you are learning to take control of your health and you are seeing great results! Just getting off the cholesterol medication is a great step to better health. If you are looking for good grass fed meat you can look at our page where to buy grass fed meat on our website and see a few places I find highly reliable or look locally as that is the best way to be sure of the quality you want. Thanks for stopping by Scott and I hope you find what your looking for! I have heard this before, although some time ago. So it was good to read up on it and see which one is better. Grass seems to be the best choice. After reading this I wondered to myself why do the farmed feed grain. Is it because it’s cheaper? I had never thought about it what the difference between the two are. I know will have to look at the packaging and see how the cattle were fed. Do they even tell the consumer? You ask some good questions Owain. Farmers mainly feed grain because it puts more fat on the animals and since they get paid by the pound they want to put all the fat on an animal they can. However this doesn’t make for the best quality meat as grain diminishes the quality of the meat. Unfortunalty labeling in the stores doesn’t always tell you much about the quality of the meat and what the animals ate. Even some so called grass fed beef has been fed some grain the last few weeks before it was processed. The best way to know is to buy from a farmer you can trust and there are getting to be more and more grass based farmers raising good quality meat. I try very hard to eat only real food. And it is very difficult here in America because companies don’t have to tell you what products are GMO. I prefer grass fed beef and only use eggs from free-range hens. But the frustrating thing is that you never really know the truth. I believe that the obesity problem in the US is linked to all of the chemicals, GMO, hormones and fake crap that is added to all processed food. Even cows are fed corn which is 90% GMO rather than grass in order to fatten them up. Blogs like this are going to help make a difference. I will be sure to share it with my followers. Grass fed all the way! You are so right Wendy! it is nearly impossible to eat safe, healthy, nutrient rich food in this day. We got to this point by letting corporations dictate what we eat without any accountability and now that nearly everyone is dealing with health issues it is time to educate ourselves and turn to food that is health promoting and not health depleating. Thanks so much for your encouragement and for sharing this vital message. Something to think about as well is the environmental impact that beef alone has. Now I like beef, but the more we consume, the worse impact we have. I hear that when we switch to chicken or something else, the ozone and other things get less impact. Not to mention that grass can regrow. And we could be using those grains to feed a lot of the world. The environmental impact of how beef is raised is a large issue for sure Drew! The truth is we need less grain fields and more grass lands and managed grazing of herbivores to benefit the ozone. Eating more chicken has a more negative impact on the environment than beef since chickens require a huge amount of grain and that takes lots of heavy diesel equipment to plant grow and harvest as well as transport. well managed pastures can produce a lot more food per acre and require less infrastructure. Good pastures are a win win for everyone. I am glad that you explained the difference between grain fed and grass-fed beef. What specifically caught my eye was when you said that the nutrient content of grass-fed beef is much higher than grain fed beef and that many labs gave documented that all mineral and vitamin levels are a lot higher in many cases. I am trying to build my body so that I have more muscles, which implies that I should consume more meat than what I was used to. With this information, I’ll definitely be more mindful of the kind of beef that I will be buying and consuming so that I can achieve my fitness goal faster. Glad the info was helpful James! It is so important to have nutrient rich food to give our body the building tools it needs. Most food today keeps us going but isn’t nutrient dense to help us thrive rather than just survive.